Nifty had another day of huge volatility but ultimately closed flat at 5854.75, a small gain of 4.45 point. The only heartening point for the Bulls was that the low around 5825 was promptly bought by the responsive buyers. The broader market though was very weak, with just 422 advances to 1083 declines. 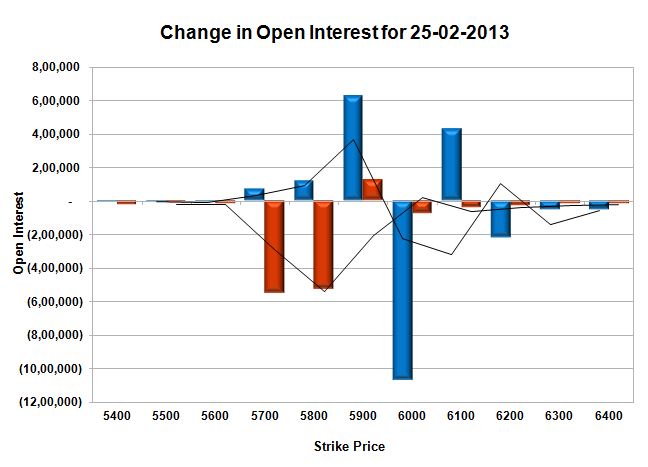 As per OI table, the range of 5800-5950 still remains for tomorrow. Call option 5700-5900, 6100 added 12.48 lacs huge amount of OI with profit booking seen at 6000 and above 6200 strike prices. Put Option 5900 added 1.22 lacs huge amount of OI with huge profit booking seen at 5800 and lower strike prices. 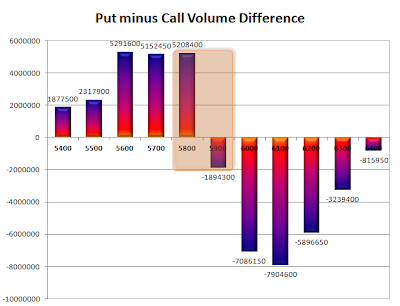 Highest accumulation on Call option 6000 at 93.2 lacs & 6100 at 87.65 lacs whereas Put option 5800 at 71.04 lacs & 5700 at 55.51 lacs. Nifty Open Interest is at 1,65,60,200 down by 7,29,000, whereas March series added 16.85 lacs with no change in price, most probably 100% rollover with huge short build-up. Bank Nifty Open Interest is at 12,36,925, down by 92,225, whereas March series added 1.4 lacs with decrease in price, most probably 100% rollover with huge short build-up. FII’s sold huge 7.36 lacs of Futures, most probably short build-up, as their net OI increased by 33077 contract and the average price per contract comes to around 5880. FII’s future open contract as on date is 413258. 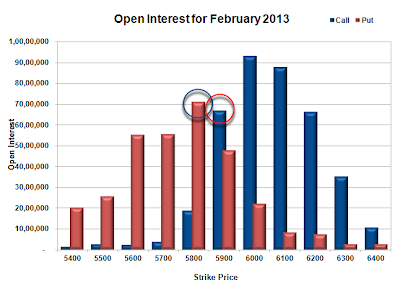 PCR Open Interest (Volume) is getting weaker by the day and now at 0.804. Support still very much at 5800PE, though covered huge OI for the day and below that at 5700 with OI of 55.5 lacs. 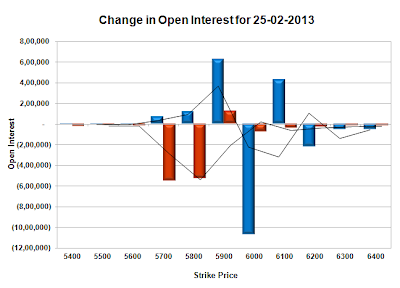 Resistance at 5900CE, with huge OI of 66.8 lacs, and above that at 6000 with highest OI of 93.2 lacs. Range as per Option Table is 5815 - 5893 and as per VIX is 5803 - 5906 with 5870 as the Pivot.